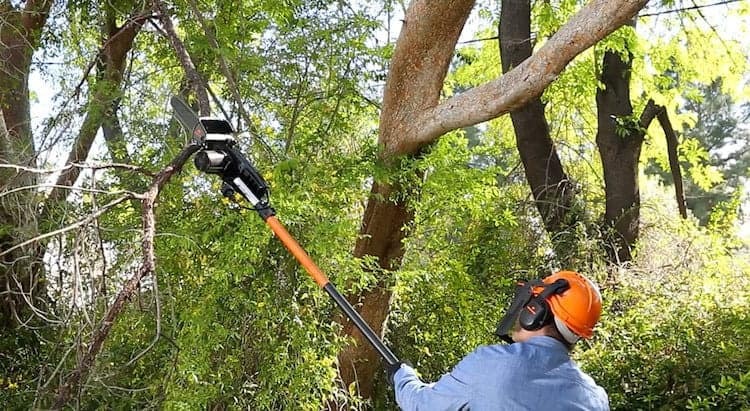 If you have branches in your yard that are hard to reach, the electric pole saw is the tool to use when it comes to trimming. However, with so many models on the market, which is the best electric pole saw for you? Do you opt for one with the most powerful motor? Or maybe a cordless saw would better suit your needs. To help you in your search we have brought together 5 of the best pole saws on the market today. For our top rated choices view the table below. For our dedicated buyer’s guide and in depth electric pole saw reviews – keep on reading. The simplest way to describe an electric pole saw is to call it a small chainsaw on a pole. In fact some people do call it an electric pole chainsaw, or a telescopic chainsaw due to its functionality and design. The tool generally has a trigger on the handle at the base of the pole. Squeeze this and the chainsaw at the end of the pole fires up, ready to tackle those hard to reach trimming tasks. Pole saws come in a variety of guises. The fact you have reached this page means you are interested in buying an electric version, however let’s take a moment to look at the other types of pole saw available. It all had to start somewhere. Even before the advent of electricity, farmers and gardeners of old would attach a sawing instrument to the end of a pole in order to tackle high branches. While today’s manual tree pruners have come a long way, the principle remains the same; good old-fashioned manual effort is required. 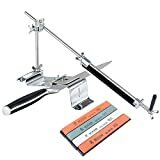 Manual pole saws are the most affordable option and if you intend to only do minor trimming it could be the best option for you. If reach isn’t an issue, you may only require the use of a small foldable pruning saw. On the other end of the spectrum we have the gasoline powered pole saw. As you might imagine, this is the most powerful of all the different types of pole saw and are mostly used by landscapers and gardeners for heavy-duty work. The robust nature of the tool means they are also the heaviest. However, the fact they can run for hours on end and can cut through thick branches makes them a popular choice for professionals. 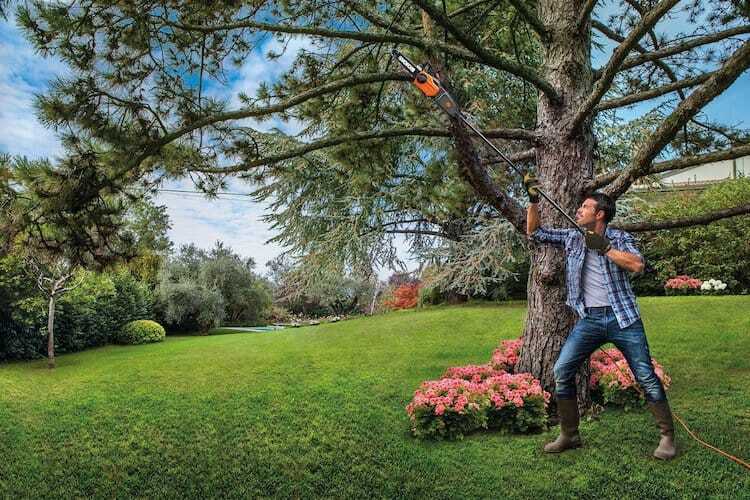 The corded electric pole saw is the most common tree pruner you will find in the suburban garden. Easy to operate and virtually maintenance free, they are lightweight and extremely effective. For homeowners with small to average sized yards and only the occasional amount of tree pruning required, the electric pole saw is highly recommended. Electric power pole saws are also a lot quieter than their gas powered cousins. One trade off is the fact that you have to be tethered to an electrical outlet. However, to over come this you can opt for a cordless power saw. As the name suggests, a cordless pole saw does not need to be connected to an electrical outlet in order to operate. They rely on batter power instead. 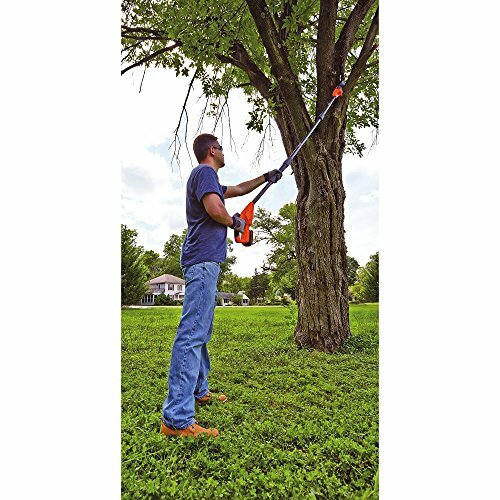 As mentioned above, corded electric pole saws are ideal for smaller to average size yards, within easy reach of an electrical outlet. The benefit over a cordless model is that you will not lose power and the tool is strong enough to take care of your home-gardening, tree pruning needs. A cordless model comes into its own when you have a large garden with no power access. They are versatile in that you can just pick up and go. However, in some instances you may need to have an extra backup battery. Running out of juice halfway through a job is never good. With the wide range of electric pole saws on the market today, it is important to know what features are available to you. Whether it’s the extra telescopic functionality, higher-powered motors or fast acting battery chargers, there’s a lot of things to consider before you part with your hard earned cash. However, a good starting point is to look at your own requirements. Then you can decide what features are most important and thus the type of saw you should buy. The majority of electric pole saws have a working height of between 10 and 15 feet, (including the reach of your body and arms). If you have tall trees in your garden, the longer reach will probably be required. What size branches do you want to fell? 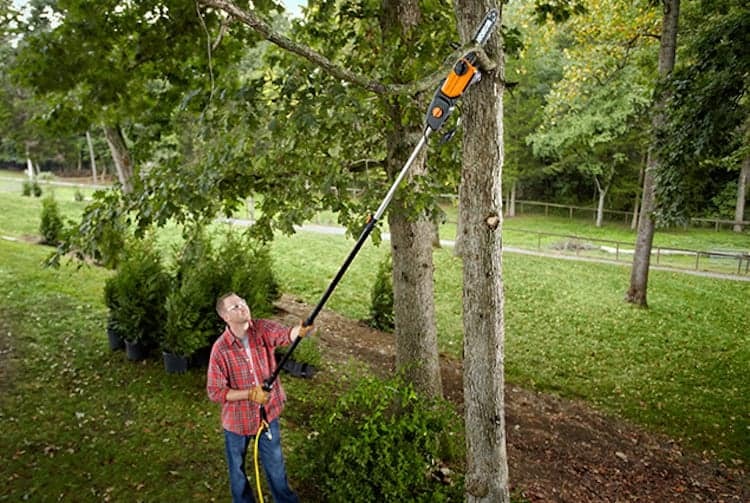 Electric pole saws are designed to tackle soft or hardwood branches up to 4 or 5 inches across. However, a general rule of thumb is the larger and more powerful the motor, the wider diameter branches you will be able to trim. Electric pole saws are certainly lighter than gas powered models, however you will still need to consider your own strength and stamina when it come to holding one at length. For the majority of users, simple backyard use with an electric pole chainsaw does not present a problem. However, extended use over a few hours will likely give you a backache, (the weight is all top heavy after all). Prices for electric pole trimmers do vary. The lowest cost models start at under $100, while premium electric pole saws can reach over $200. Your budget and your needs will all help you decide which range model you should buy. Top brands will very often provide full or limited warranties on their products. Clearly the more comprehensive the coverage the better. Budget models will also provide some kind of warranty, however length and terms do fluctuate. Be sure to take a look at what your chosen brand has to offer. If you are deciding between two different manufactures, the warranty could end up being a deal making or breaking issue for you. Light weight and easy to manoeuvre in line with your own abilities. Has the reach that you need (telescopic pole chainsaws can come in handy here). Has sufficient power for your trimming needs. Has a comfortable handle and anti-vibration systems so that the tool is enjoyable to use. Has extra features such as self-lubricating chains. Is easy to store – a two-piece breakdown is good for this. Has good coverage in the form of an extended warranty. The best pole saw for you is one that can cover all the tasks that you need from it, in one easy to use and affordable (for your budget) package. Let’s take a closer look at our top 5 electric pole saw reviews to see which one it could be. 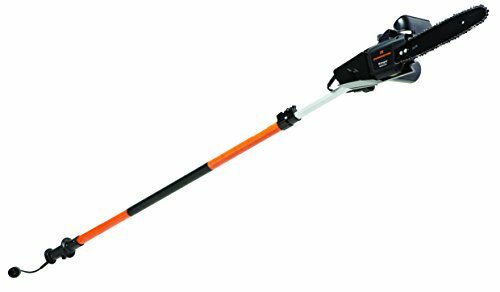 The Sun Joe SWJ800E gets our top pick best electric pole saw because it balances affordability, great features and performance, all in one package. 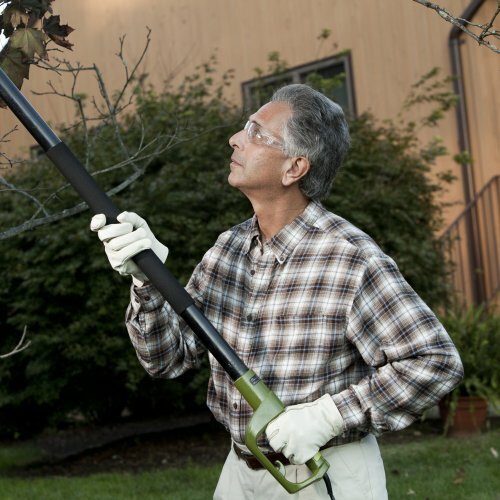 Put simply, the Sun Joe is an ideal compliment to any home gardener that needs to trim back branches with ease. Right out of the bat, the Sun Joe gets top marks for its reach. Featuring a telescope design, the full length of the saw is able to extend to 8.7 feet providing a total overhead reach of approximately 15 feet. Under the hood, (or more accurately, packed into the top end) is a mid-range powered 6.5 amp motor. 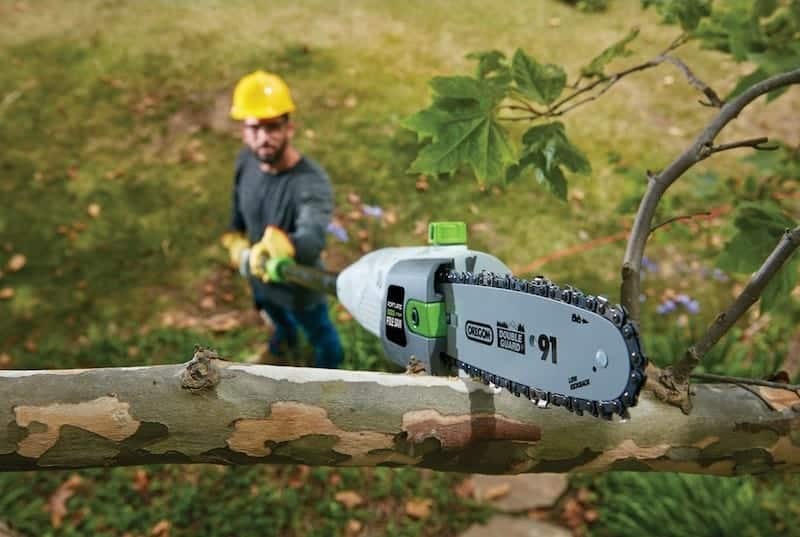 While not the most aggressive motor available, this will still adequately power the tool for cutting overhanging limbs, branches and thin logs. In fact Sun Joe state that the motor is able to power the saw through branches up to 7.5 inches thick. No messy about there I am sure you agree. The tool ships with an 8-inch Oregon cutting bar and chain that holds up to general-purpose use very well indeed. For added longevity, this excellent tool also has automatic lubrication. Maintenance worries are a thing of the past, which is very handy if you are not particularly technically minded. Operation is nice and easy. The operator only need push a button to power up the tool, (no smoke, fumes or the need to tune up as you would experience with a gas powered model). The SWJ800E also contains a built-in safety switch to prevent you starting up the motor by accident. One of the defining features is the fact Sun Joe have made the tool extremely lightweight. You will be able to use the saw at full arms length for a substantial amount of time, no matter your personal strength. This ease of use extends to the actual assembly too. It is very simple to fix together. And while the pole itself feels very sturdy, the telescopic functionality is quick and easy to access via a simple adjustment lock. Another clever little touch is the fact the oil reservoir has a window so it is easy to see the level of oil. No need for guesswork or clumsy dipstick action. To top it all off the unit is completely CSA approved and comes with a full 2-year warranty. One button starter control, (with built in safety switch for accidental start up). There is very little to fault here. Motor could be a little larger considering what is available within some of the other electric pole saws reviewed here. Another top notch product from Sun Joe. The SWj800E ticks all the right boxes from our buyer’s guide. A great value electric pole saw with stacks of excellent features. Built to last while still being light to use, it is difficult to fault this machine. In our opinion the best electric pole saw on the market today. 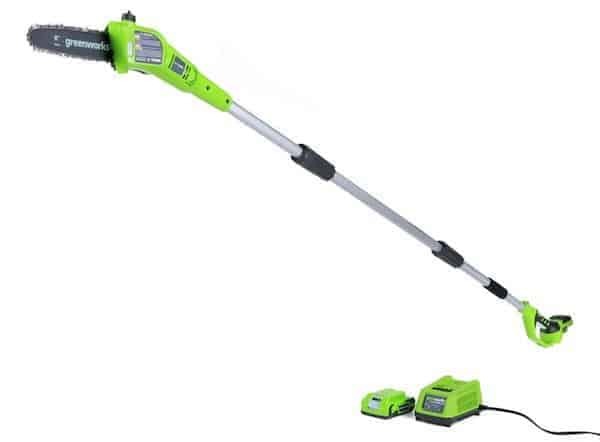 The Remington is another very well received electric pole saw that opts for an 8 amp motor under the hood, while offering a reach of up to 15 feet overhead from a 10 foot pole. This may be a time to mention the way that many manufacturers discuss and advertise the overall reach of a pole saw. 15 feet with a 10 foot pole is basically incorporating the average height of the user into the equation. If you’re standing up right with arms stretched and using a 10 foot pole saw, you are likely to reach branches 15 feet in height. For the purposes of clarity, each of our pole saw reviews uses the same system while discussing the overall reach for each of the models in our top 5. With that out of the way, back to the pole on the RM1025P. 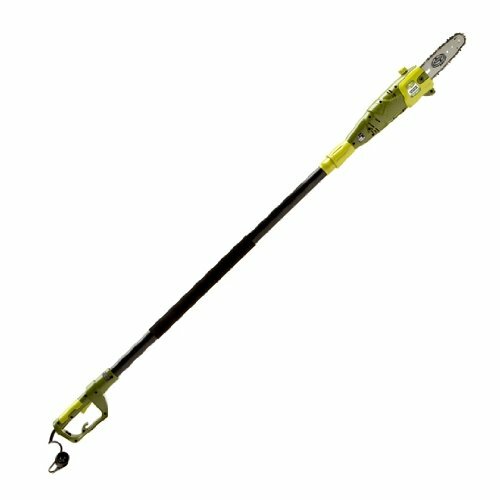 The telescopic design features a 2-in-1 detachable mechanism, and is pitched at those wanting to carry out hard-to-reach small limb trimming, (up to 15 feet overhead). The telescopic pole contains an easy flip and lock clamp so you can rest assured everything is secure as you work. A anti-rotation system is also in place for ease of use. Handle design is comfortable enough and features a non-slip grip. The chainsaw element contains a low-kickback 10-inch bar and chain. For easy maintenance the motor has a push-button oiler with easy-squeeze bulb so that the right amount of oil is used. Some users have complained that the trigger action has some design issues. A good all round electric pole saw with great reach and power. A couple of niggle design flaws have effected some users, however these reports are in the minority. Overall a recommended pole saw for the money. Here we have another great electric pole saw for those that are after similar power and reach as provided with our top pick Sun Joe. 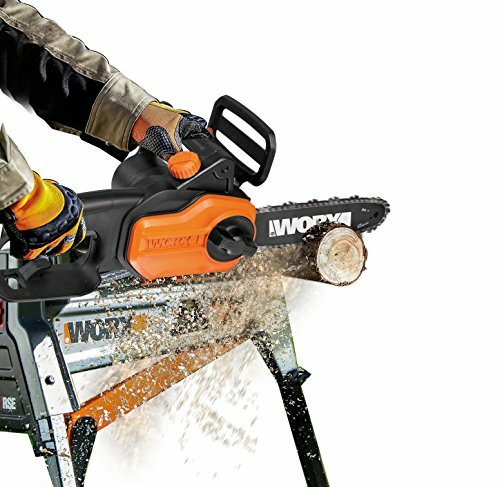 So while the SWJ800E is the perfect for the everyday gardener with an average sized yard, the WORX WG309 really comes into its own for more general purpose cutting tasks around the yard – the main reason being it can act as a stand alone chainsaw, without the pole attachment in place at all. Powering the chainsaw is powerful 8 amp motor. To ensure reliable performance WORX have fitted the WG309 with their patented auto-tension chain system. This helps extend the life on the chain, while reducing wear and tear on the bar too. A real plus point is the aforementioned fact that the WORX can be used as a chainsaw without a pole. However, when it comes to the hard to reach spots, you simple attach the 8 foot pole and away you go, (no tools are required to fasten everything into place). On the down side, those without the necessary muscle power may struggle with the pole and saw at full reach. The machines is very top heavy under this configuration so bare this in mind. 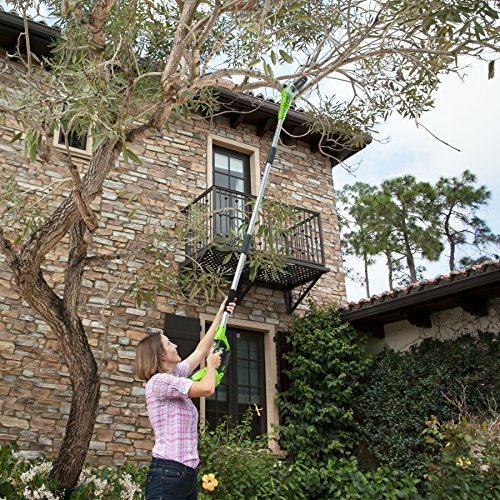 For easy pruning, the design incorporates a rotatable working handle. Other features include an automatic oil pump with level indicator for easy maintenance. The tool is very top heavy with the chain in place, meaning you will feel the muscle burn after extended use. 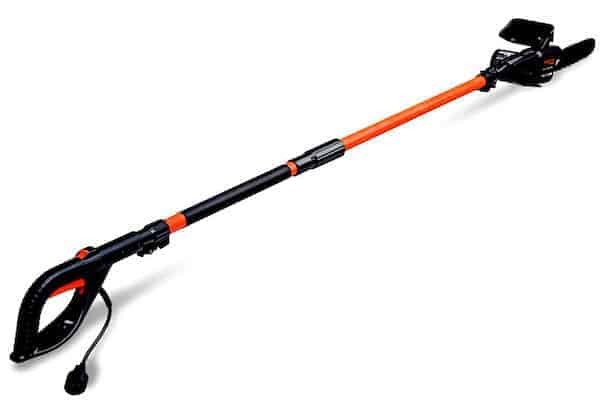 A great electric pole saw with nice sized motor and a reach you will be pleased with. However, the machine is top heavy with the chainsaw in place, so it is not suited for all users. If possible, try before you buy. 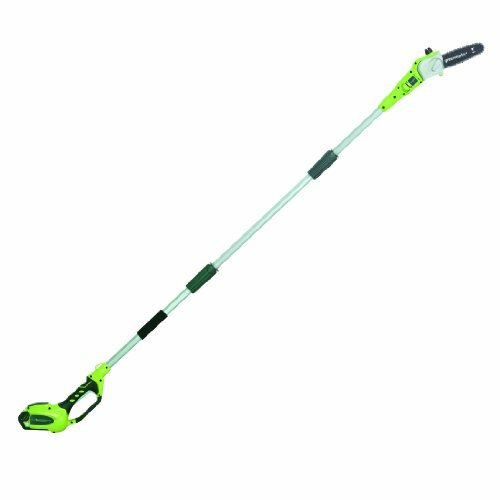 We have now reached our top pick cordless electric pole saw. The Black & Decker receives this lofty accolade because of the excellent balance between affordability, long battery life and ease of use. The tool is powered by a long life span, 20-volt MAX lithium-ion battery. These bad boys are built to keeping on providing the power, and contain better charge retention than your average NiCad battery. Which of course is exactly what you need if you’re out in the field trimming without easy access to an electrical outlet. 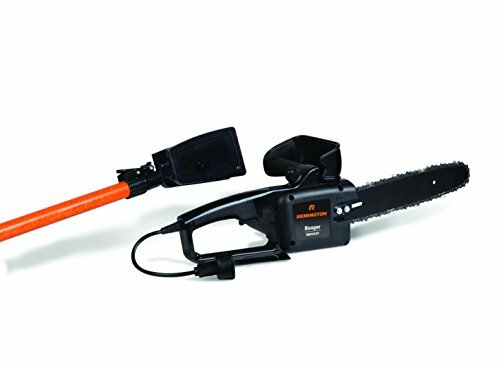 For basis of comparison, the manufacturers state that the LPP120 can make up to 100 cuts of 1-1/2-inch pine branches per charge. You might assume that they are referring to wood diameter up to 6 inches, as this is the maximum cutting width of the Black & Decker LPP120, (the tool features an 8 inch cutting bar and chain). Maximum reach is also well catered for here. The pole allows for a usable length of 6-1/2 or 10 feet, with an overhead reach of 14 feet. 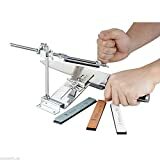 At just 6.3 pounds the tool is easy to control too, with little of the uncomfortable top heavy issues that can plague battery powered models. When its time to pack everything away, the LPP120 cordless pole saw disassembles into a nice compact size and has a blade guard for safe handling. For those interested in the warranty details, the ever-reliable Black & Decker throw in a 2-year limited warranty. The LBXR20 Battery and LCS20 Energy Star-qualified charger are also included. One final point that could be a benefit. If you own any other black & decker cordless tools, (or plan to buy some) the LPP120 is compatible with the full line of Black & Decker’s 20-volt MAX line of products. 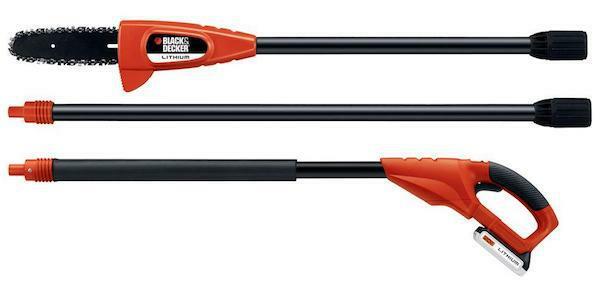 Our top pick best cordless pole saw from Black & Decker is a fun tool to use. 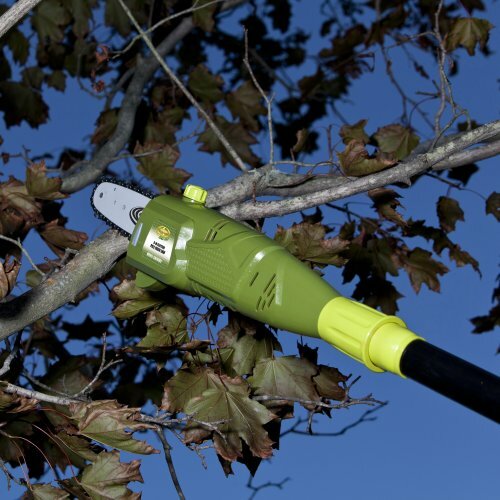 Good battery life, while being lightweight and easy to manoeuvre, this is an excellent option for those that need to trim those branches without a power outlet nearby. Highly recommended. GreenWorks have a really good reputation in the power tools market. As the name suggests, the company aims to produce environmentally friendly power tool options, that forgo the need of gasoline or other pollutants. And of course, the 20672 cordless power saw is no different. Opting for the G-Max 40v battery to power the machine, what you have here is a saw that packs quite a punch while out in the field. 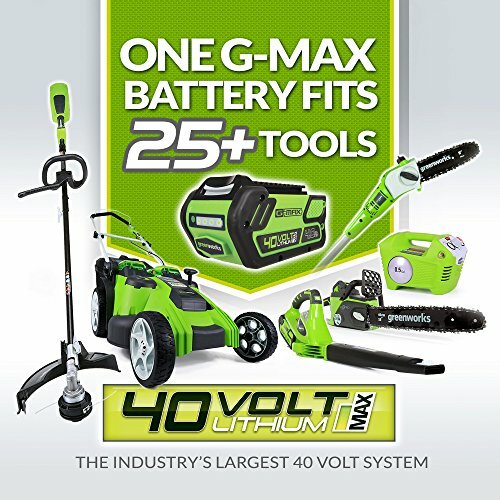 Like the Black & Decker reviewed above, GreenWorks incorporate the G-MAX 40V Li-Ion Battery System in a whole line of their products. If you choose to buy one of their products, there’s a great opportunity to purchase further tools for a complete yard system. The 20672 also opts for the 8-Inch bar and chain, (which is pretty much standard for easy trimming of branches). Features such as an easy adjust chain-tensioning system make an appearance too, as does an automatic oiler. All of which demonstrate the company’s attention to detail in providing a tool that really makes the grade. Reach is good, with the 3-piece aluminum shaft extendable to 8 feet. There’s none of the annoying top-heavy action either. The battery is installed at the handle base making the GreenWorks cordless pole saw well balanced and easy to control. 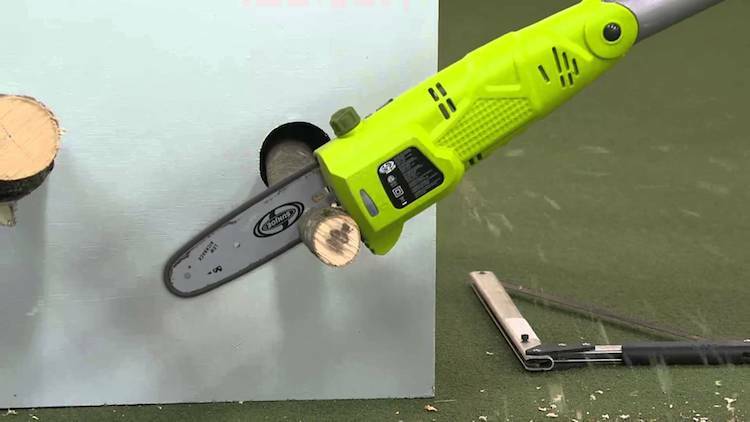 If you already own a tool from GreenWorks and are happy with your purchase, what are you waiting for – this is the cordless pole saw option for you. Newbies to the brand should also take the jump. This is a quality cordless that will take care of your trimming needs for many years to come. You need to have a clean and uncluttered area to effectively work with this equipment so that your movement is unhampered. You need to be at an angle to the branch which needs to be pruned. Do not stand directly below the branch as when it falls, otherwise an injury might occur. Before the actual pruning starts, the user needs to be sure of the branch which needs to be pruned. One needs to effectively reduce the weight of a branch before actually cutting it. The user must make good and clean motion keeping the saw parallel to the branch. This way the saw gets in deep to create a path for the quick cuts which come at the end. 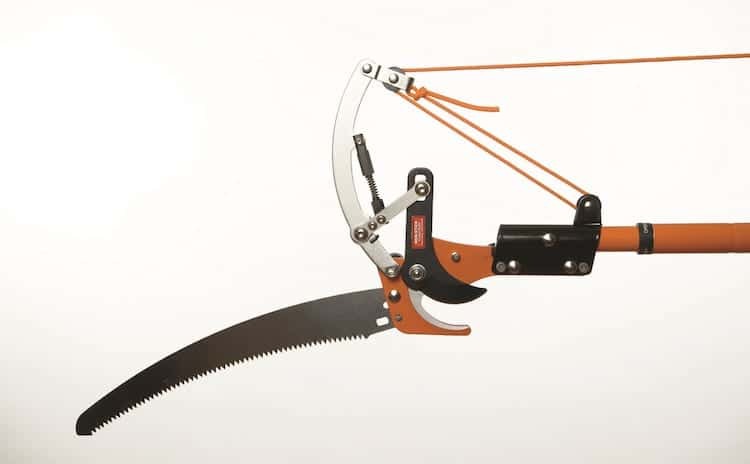 When the saw has made enough headway into the branch, the user must increase the speed of the cut and complete the pruning process. One must also be aware of their surroundings to be able to move out of the way before any harm comes from the falling branch. User should clean the clutter and begin again to do further pruning/cutting. One major concern for the users is the kickback of the saw, which if not handled properly can cause significant damage to the users. Users must wear proper eyewear to protect their eyes from any dust or residue as while handling such equipment, absolute focus is a must. Proper position is very important for the user while cutting the branches as a heavy branch might fall over them and trap them under. They must be quick to retreat if they feel such a situation might arise. 1) The electric pole saw must be regularly cleaned so as to make it effective over a long period of time. The saw cover can be opened to remove the chain of the saw and clean it with a toothbrush dipped in soap water. 2) The groove on which the chain rests should also be cleaned as some gunk might get stuck in it. 3) The oil reservoir on the saw must be filled routinely to make the chain lubricated and avoid overheating. 4) In case of corded electric pole saw’s, the voltage of the source must be checked. 5) In cased of the cordless saw (battery powered), the battery must be regularly charged.